WCDS - Wakefield Country Day School > The Roost > The Classroom > Deciduous, Coniferous –– or Both? Christmas in August? Not quite, but WCDS third graders did start the new school year with visions of Christmas trees as they hiked around campus observing the difference between evergreen and deciduous trees. “The kids were super excited to spend time outdoors collecting leaves,” said teacher Becky Ernest, leader of the young explorers. Once the group gathered the leaves, the class worked in pairs or trios to sort the needles and leaves into two collections, coniferous or deciduous, and this led them to discuss the different tree characteristics. “We learned that there are trees identified as both deciduous and coniferous,” commented Elliott Feeney after hearing of evergreen trees that lose their needles. 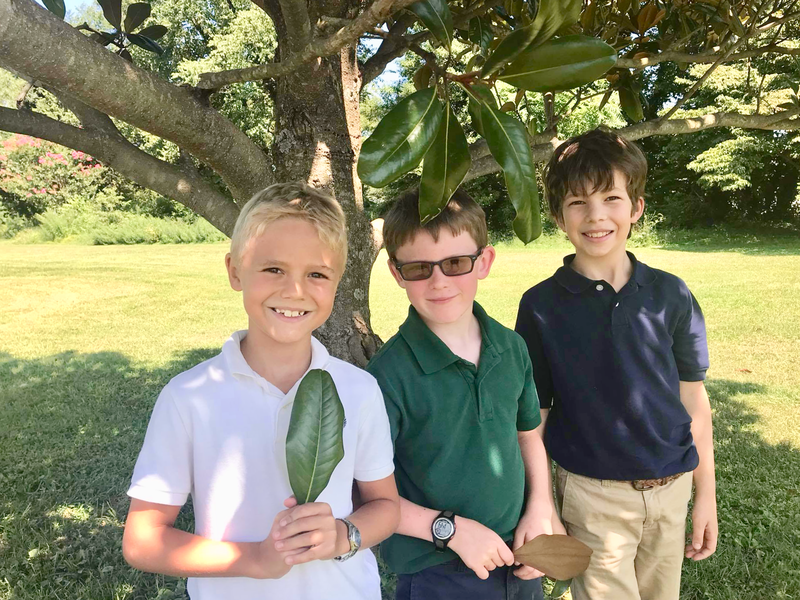 Elliott Feeney, Bumper McKee, and Dryden Whitson delight in their outdoor classroom as they observe and classify leaves.